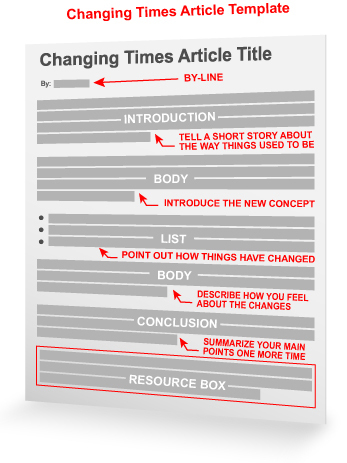 Whether you consider yourself “old school” or “new school,” this article template gives you a format to share your argument with the world. In just about every niche, you can find members of the “old school” who like to reminisce about times past. At the same time, there are members of the “new school” who, no matter what the cost or benefit, remain on the cutting edge and are ready to test out new products and procedures. So how do you find the balance between “old school” and “new school”? Are there any areas of your niche you think: “Back in my day”? Are there any areas in your niche that have become more complicated as the industry has evolved? Are there any areas in your niche that have become easier due to advances in technology or resources? You may not be a magician, but the Tricks to Do X article template could be the perfect way to share the tricks of your trade with your readers. 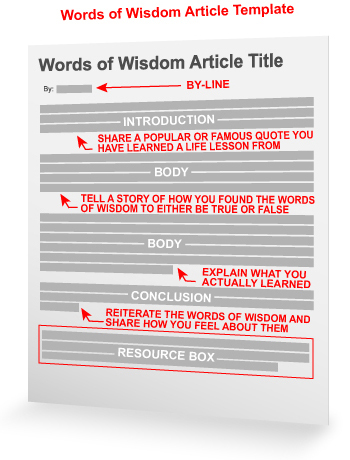 This article template converts your specialized knowledge into a scarce resource to share with your readers. Most trick-based articles start with a task that is complicated, time consuming, and something that may require a learning process. 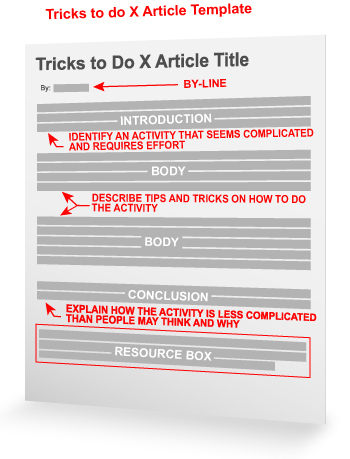 The Tricks to Do X article template shares how to sidestep those complications and accomplish the task through tips and tricks. Pick a Trick – Identify a trick that saves time, money, or effort on a complicated task. To pick the trick, think about activities that require a high-level of effort. For example, this may include varying degrees of a planning process to achieve a goal or milestone. Announce the Trick – Use the introduction to name the trick and give it a brief explanation. Sometimes you might come across an activity that doesn’t have any tricks aside from being patient over a long period of time. You can still write a “tricks” article on these activities, but if you do, you’ll need to give very valuable tips. Who wouldn’t choose pleasure over pain? For your next article, consider how you can identify with your readers by promoting how they can achieve pleasure. What do your customers enjoy or want to experience? How does your niche deliver those experiences? Pleasure of gaining a competitive advantage. Pleasure of increasing visibility and brand awareness. 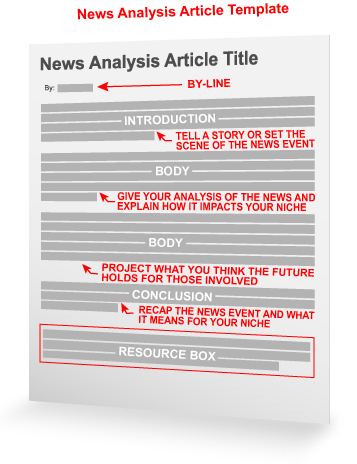 How Do You Use Article Templates? 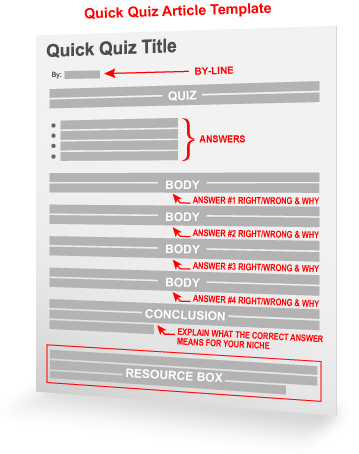 No matter how you answer this question, the Quick Quiz Article Template was made for you! Many Expert Authors have found great success with this template because it provides a great hook for readers. The format is based on posing a question to your readers and explaining their choices in a clear and concise format. Posing a question with answers is also a great way to turn a mundane topic into something more engaging and exciting. You can show off a bit of your personality by adding a humorous option, or choose a set of answers that are all correct. What does the word “triumph” mean to you? To achieve where no one else has succeeded? To be a victorious hero? To win? To persevere? Stories of triumph don’t need to be epic herculean feats. Real triumph stories – the stories readers can relate to or place themselves in the story – inspire us all and prove anything is possible. Whether it’s a tale of an underdog overcoming great odds or someone dealing with a variety of obstacles to achieve success – stories of triumph are engaging and captivating. So how do you, as an article writer, take advantage of the fact people want to hear stories of triumph? 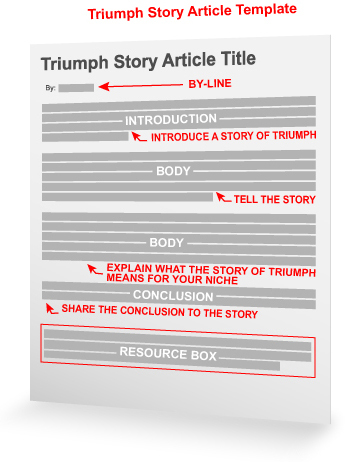 Use this article template for your next article and share a story of triumph! Consider where in your niche you are today or in your personal life. What obstacles did you overcome or what milestones did you surpass? Dig out the details and consider what keys or steps to the story make it informative and benefit others. Time is short. Dozens upon dozens of people are out there seeking shortcuts and strategies to speed up any process you can imagine. As an article writer, this creates an incredible opportunity for you to share your time management secrets to an eager audience. 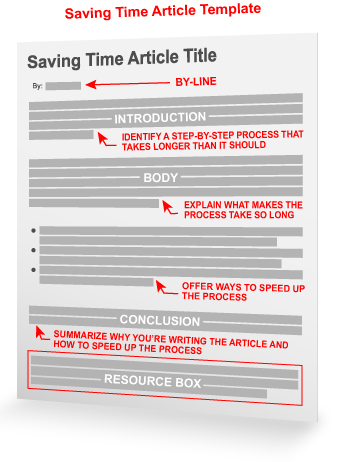 Capitalize on this opportunity by using the Saving Time Article Template. Pick a Personal Time-Saving Strategy – Originality is the key. The strategy should be something you’ve done yourself so you can give unique insight into how everything worked for you. Your strategy can be broad or specific, such as proposing a solution to manage one’s workday or how to save time while performing a time-consuming task. Identify the Time Thief – In the introduction, hook the reader by naming the process that takes more time than it should. Be engaging by identifying with your reader through active and compelling language. There are usually countless strategies on how to cure an illness or problem. For example, if you are trying to cure the flu, you might take a traditional approach, a new age approach, a spiritual approach, some combination of them, or something else. Each approach has its merits. In certain circumstances, one may work better than another, or they could come out with the same healing time. It is all about the approach. If you pull the “illness” concept into your own niche, you can think about things in your niche that cause problems and how you deal with them. This is where your years of experience and expertise shine through. 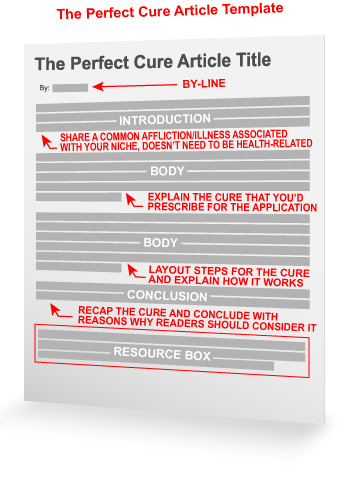 With this article template, we will share exactly how to draw the “illness” analogy into your niche and how to share the perfect cures in your niche. If after reading a quote you have found yourself saying: “I wish I wrote that!” Or believe someone else said it best, therefore there is no need for you to say it again – we have the article template for you. Famous quotations, words of wisdom, idioms, and proverbs are a great way to engage the reader and share your personal story that either proves the words of wisdom or disproves them. Some common expressions and words of wisdom can be “spot on” and teach us life lessons so we don’t have to make the same mistakes others have made in the past. In other cases, we learn that some words of wisdom may be inaccurate based on our own experience. This is something definitely worth sharing. Either way, if some personal experience in your niche reminds you of words of wisdom you have heard in the past, you can write an article about that experience. Product reviews are a fantastic way to educate consumers about their purchasing options while also sprinkling in some of your own expertise and personality. 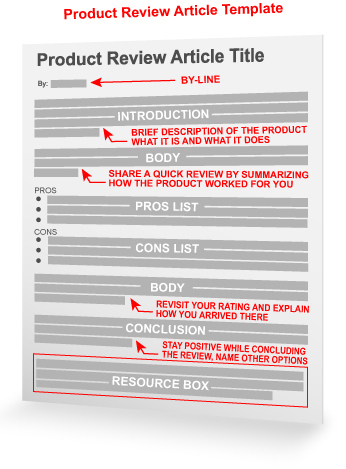 Many consumers (or potential readers) look for product reviews to gauge the effectiveness of products on the market. The Internet is a great place to share your reviews of products as it has become the #1 way consumers gather data to research a future buying decision. The greatest hurdle you must overcome when writing about a news event is the topic may be relevant now, but it may lose relevancy over time.